Shrimp Stuffed Eggs, finely chopped shrimp added to the perfect egg mixture in a stuffed egg. These are always requested at family gatherings. 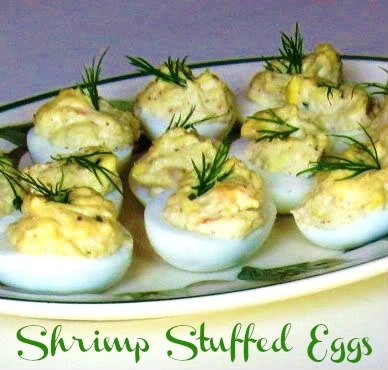 Shrimp Stuffed Eggs are a perfect appetizer to take for any occasion. They were a step up to your normal stuffed eggs at a recent get together with my high school classmates along with this Pig Candy. These are made with full-bodied filling, easy for piping. One basic recipe makes three variations to chill overnight, or you can use the filling on top of crackers, cucumbers, or little Melba Toast, and you have another appetizer. Cut eggs in half lengthwise. Remove yolks. Process yolks, mayonnaise, and next 4 ingredients in a food processor until smooth, stopping to scrape down sides. Stir cooked and chopped shrimp, horseradish, and minced green onions into egg mixture. Spoon or pipe filling into egg whites. Cover and chill up to 8 hours. Garnish, if desired. Wow, this set me off for sure! I used this great recipe as a springboard for Shrimp, Egg and Avocado Salad! Since I didn't have the patience to stuff the eggs, I just chopped them up with the shrimp and then stirred the two together with some ripe avocado I was trying to figure out what to do with! I never thought the horseradish would be so good, but it really made this special! Thanks! Hmmm...I love your idea about using these with cucumber; those scooped out cucumber boat thingys wold be perfect with this.